Modern citrus fruits, according to genetic analysis, are complex hybrids arising from mandarin, pummelo, citron and pepeda ancestors, refined by more than four thousand years of cultivation. Mandarins, known for their thin, loose peels and sweet flavor, are often classified into groups based on where they were developed, such as Mediterranean, King (Indonesia and the Philippines) and Satsuma (Japan). There are hundreds, if not thousands of mandarin cultivars. The word tangerine, originally designating mandarins from Tangiers, Morocco, is used now to describe all mandarins or just selected cultivars. Mature Size: 9-15' high and as wide. 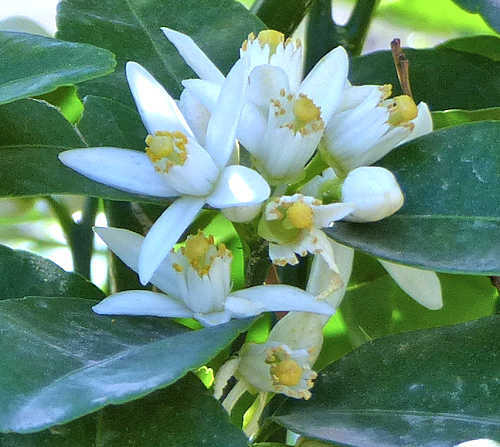 Flowers: Five narrow, white petals, long white, yellow-tipped stamens, fragrant, from red-tinged buds. Bloom: Late winter and/or spring. Some cultivars tend to bloom more in alternate years. Self-fruitful: Some are self-pollinating, except for Clementine and Minneola which need a second compatible cultivar nearby for pollination. Years before fruiting: 3-4 for trees with grafted rootstocks. Fruit: Orange in color, with a thin peel which is often loose or easily removed. Mandarins are smaller and less round, sweeter, less acidic and have a stronger flavor than the typical orange. Months for fruit to ripen: 12. Mandarins do not ripen further once picked and must be left on the tree until ripe. Some cultivars must be fully colored to be ripe, others can be light green (especially Satsumas). To tell if the fruit are ripe, one must be removed from the tree and tasted. It is ripe when sweet. If sour, they need to stay on the tree longer. Rainfall, sunlight, and temperature determine ripening times and will vary from year to year. Leaving the fruit on the tree after ripening will cause it to become sweeter as the acidity is reduced. Remove fruit from the tree using clippers, cutting the stem close to the fruit. Pulling a fruit from the stem will tear a gap in the loose skin. Storage after harvest: Mandarins can be refrigerated up to six weeks. They can be kept at room temperature one week. Leaves: Dark green, glossy, lance-shaped. Roots: Usually grafted onto a hardy rootstock appropriate for a particular region's soil and climate. 'Clementine' a small hybrid of mandarin and sweet orange, seedless unless cross-pollinated, easy to peel. 'Gold Nugget' seedless, moderately easy to peel, fruit matures mid-March and stores well on tree up to summer, fairly vigorous, medium-sized tree. 'Tango' seedless, moderately easy to peel, the fruit matures January and stores well on the tree but should be harvested before blooming. The tree is fairly vigorous and medium-sized. Thinning of young fruit is required to avoid alternate-bearing. 'W. Murcott' few seeds unless cross-pollinated, easy to peel, a medium-sized tree, susceptible to alternate-bearing, handles heat well. 'W. Murcott' is very different from 'Murcott'. Toxic / Danger: Thorns on some cultivars. Origin: China and Southeast Asia. USDA hardiness zones: 8b-11 after three years in the ground. Sun: Full sun. Tolerates part shade. Afternoon shade helps when temperatures are over 90°F. Drought tolerant: Somewhat, after three years, but not without damage to fruit crop. Water after becoming established: Weekly between June and September, allowing for rain. The top one inch of soil should dry out, but do not allow soil to become completely dry. Water may be needed more frequently in the hottest months of the year. Young trees need water more often than older trees even though older trees need more water in total. A sign of insufficient water is leaves turning dull and curling inward from the edges. Soil: Well drained, low salinity, pH 6-7.5 (slightly acidic to neutral). A pH of 6.5 is ideal. Alkaline soil may result in iron deficiency. Poorly draining soil results in root rot and poor performance. Fertilize: Do not fertilize the first two years. Apply an organic fertilizer every month from mid-February to early October. Use a citrus micronutrient solution three times a year in February, May and August. Do not fertilize after October to keep the plant from producing new growth that will be harmed by early frost. Mulch: In spring, remove the previous year's mulch and put down a new layer of organic mulch to reduce water loss and reduce weeds. Keep mulch at least 6" away from the trunk to avoid collar rot. Planting: May be grown in large containers. First Year Care: Remove all fruit, if any, when first planted. Remove all fruit developing in the first three years so the plant will direct its energy to growing roots, branches and leaves. Water weekly between June and September, allowing for rain. The top few inches of soil can dry out, but do not allow soil to become completely dry. Prune: Do not prune until spring because leaves store their maximum food in mid winter and pruning then will reduce flowering and fruit set. In spring, remove excess young fruit during heavy set years. Remove weeds above roots by hand-pulling, not with tools that can damage shallow roots. When shaping into a tree, unshaded trunks and branches must be painted with tree trunk paint to protect against sunscald. Litter: Leaves throughout the year, mostly during flowering. Flower and fruit drop in spring and summer as the tree self-regulates the number of fruit it can bear. Pests: The Giant Swallowtail Butterfly caterpillar. This larvae resembles bird poop and has white and black and/or brown splotches. On a large plant it will cause no harm. 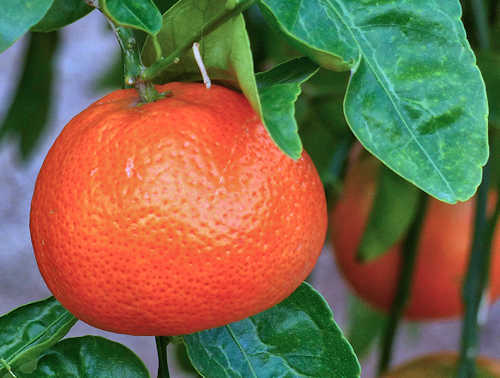 On a small plant, relocate it to a large citrus.